Growing up as a child I adored the spaghetti Western movies that were on television on a Sunday afternoon and loved that one day during the summer near the school holidays when we could dress up as a cowboy or indian in school. Needless to say, I chose to be a cowboy! 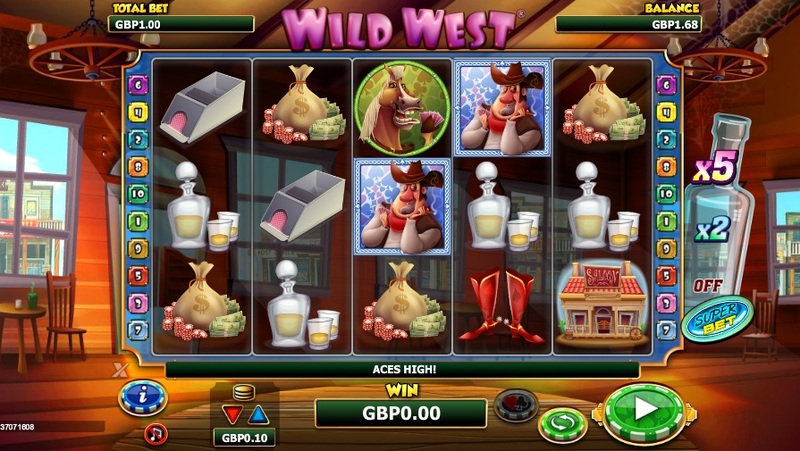 So due to this obsession with cowboys as a kid I am always more than happy to review a cowboy-themed slot and innovative slot developer NextGen Gaming have brought this Wild West slot to my table. Wicky Wicky Wild Wild West! 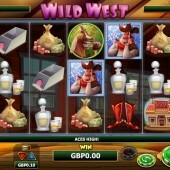 Wild West is a 5 reel, 10 payline slot that could not be any clearer about its theme by its name. The setting is the Wild West in America where cowboys roamed the land and it was all about being the fastest gun slinger in the West. To say I am excited to review this is an understatement! There are a wealth of Western-themed symbols to spin on the reels including the buxom barmaid, the comedy horse, the saloon, the bag of money, some whisky, cowboy boots, and a deck of cards that fill the positions. The Wild is represented by the cowboy himself and he can substitute for all other symbols, except for the chip stack Scatters, to complete any possible winning combinations that might appear across the reels. It only appears on reels 3, 4, and 5. There is a free spins bonus round that can be triggered but this is not by the generic three or more Scatters. Instead you will trigger 5 free spins if you land a cowboy symbol on a winning combination. It is possible to re-trigger the free spins if you hit a cowboy symbol on a winning combination during a free spin. Unusually, the chip stack Scatters only appear during the free spins bonus round. If you land the chip stack Scatters on the reels during the free spins then this will repeat the win achieved with the cowboy symbol that triggered the free spins. It does sound a bit more complex than your run-of-the-mill free spins bonus round but you'll get used to it. This NextGen Gaming slot also comes with the SuperBet feature that fans of slots such as the mystical Merlin's Magic Re-Spins and the light-hearted Foxin' Wins Again will be pleased to see. Basically, this is an additional wager where if you select the SuperBet and play 10 paylines plus 40 coins then you can win 5x multipliers on any Wild wins. You can also choose the less risky option of 10 payline plus 10 coins to earn a 2x multiplier for Wild wins. Overall, this is not a bad slot at all. It has a similar feel to it as other Western-themed slots from NextGen Gaming including the humorous Wildcat Canyon slot and the moderately enjoyable California Gold. However, it is far from NextGen's best slot and it will take some time to get used to how the free spins bonus round works. The lack of any other bonus features leaves it feeling like it could offer more but it could be worse. You will get some bang for your buck but the thrills will not last forever.